The arch of the Sergii at Pula, Croatia. Peasants of Slavic ethnicity are walking by with their ox cart. James Stuart, Nicholas Revett and their assistant are on top of the arch, making drawings. On the left a man informs the women gathered that the travellers are searching the Arch of the Sergii for treasures. Arch of the Sergii at Pola. STUART, James / REVETT, Nicholas. 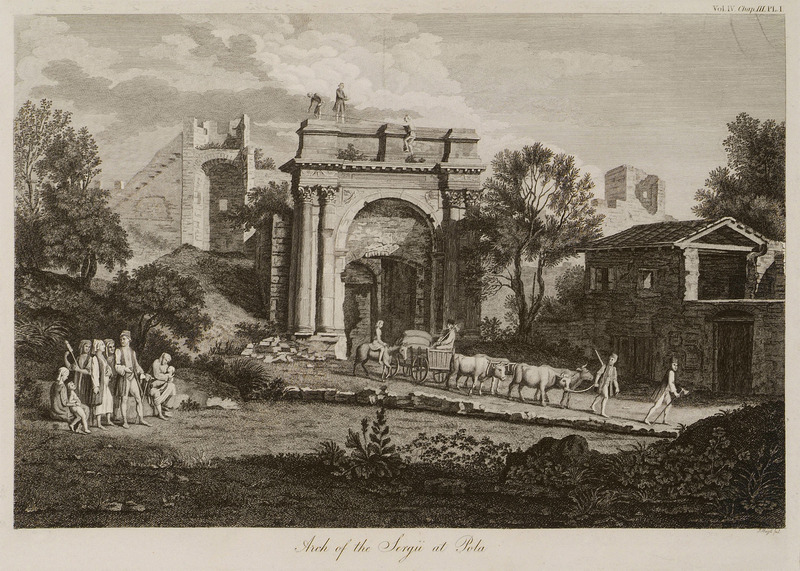 The Antiquities of Athens measured and delineated by James Stuart F.R.S. and F.S.A. and Nicholas Revett painters and architects, vol. IV (Ed. Josiah Wood and Joseph Taylor), London, Thomas Bentham, 1816. STUART, James / REVETT Nicholas. The Antiquities of Athens measured and delineated by James Stuart F.R.S. and F.S.A. and Nicholas Revett Painters and Architects, vol. IV (ed. Josiah Wood, Joseph Taylor), London, Thomas Bentham, 1816.